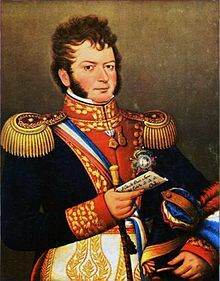 Bernardo O'Higgins Riquelme (1778–1842) was a Chilean independence leader. Along with José de San Martín, he is credited with liberating Chile from Spanish rule. Although he was the second Supreme Director of Chile (1817–1823), he is considered one of Chile's founding fathers. He was also the first leader of a fully independent Chilean state. This page was last changed on 22 April 2019, at 13:29.